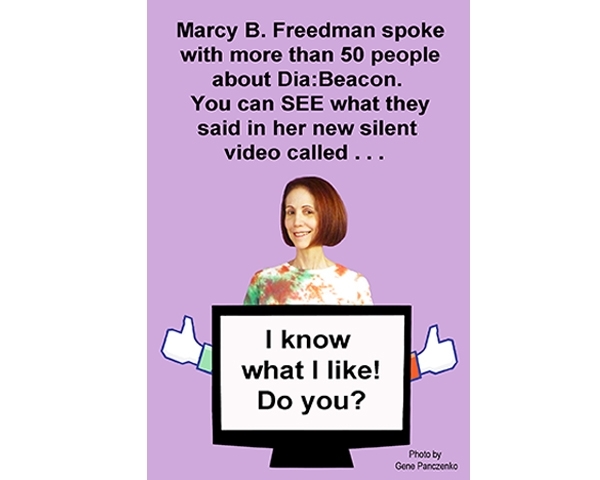 In July of 2013, I spent several days on the streets of Beacon, video-taping people willing to talk to me about the amazing museum in their midst, Dia:Beacon. I used the footage to create a silent video with title cards called “I know what I like! Do you?” This piece was shown in a shop window as a part of the month-long event called Windows on Main Street. While the video installation was cool, the best part of the project — for me — was the interactive performance part — that is, talking with all sorts of people about the kind of “strange” art to be found in a museum like Dia:Beacon!